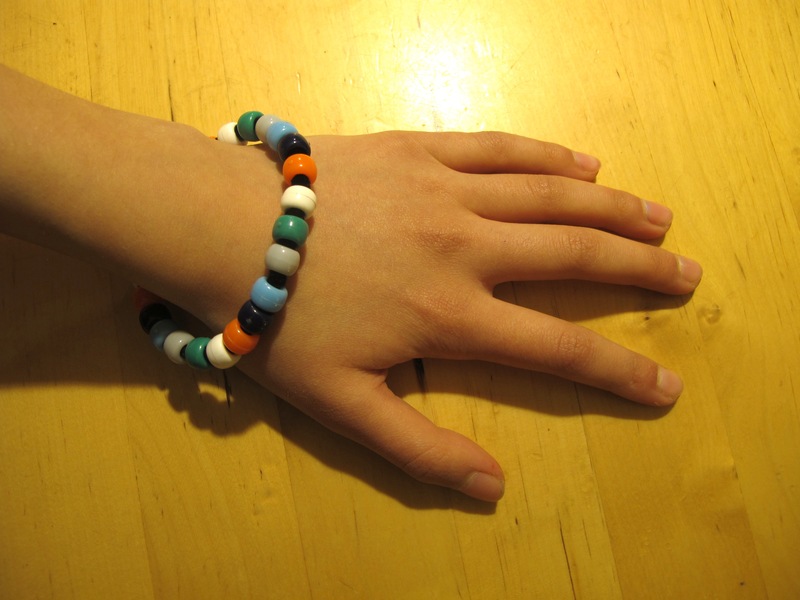 Students make a bracelet with repeating colours of beads, each colour of bead representing stages of the water cycle. Each student makes a bracelet with coloured beads. The beads are threaded in an order that represents the stages of the water cycle. Image 1 uses these colours representing these steps of the water cycle: dark blue (ocean, lakes and rivers), red (evaporation of liquid water to gaseous water vapour), yellow (water vapour), green (condensation of water vapour to liquid water drops in clouds), purple (clouds), light blue (precipitation). Images 2 and 3 use these colours representing these steps of the water cycle: dark blue (ocean, lakes and rivers), orange (evaporation), white (water vapour), green (condensation), grey (clouds), light blue (precipitation). With the wooden beads, we repeated the cycle twice. With smaller pony beads we repeated the cycle four times. Once made, an adult can secure their bracelets on each student's wrist. By tucking the pipe cleaner ends inside the adjacent beads, an unbroken circle of repeating bead colours represents the endless cycling of water on earth.